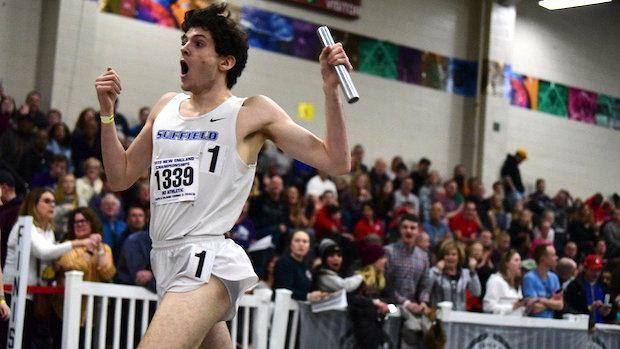 WATCH: Suffield Boys Break New England Champs 4x800 Record! The Suffield boys were ecstatic with their breakthrough win and time in the 4x800 meter relay at the CIAC State Open getting just under 8 minutes at 7:59. How do you think they felt after winning the New England Championships title on Saturday dropping a full 10 seconds off their state meet performance and breaking the meet record with a US #3 time of 7:49.96? On cloud nine as they now will be one of the top seeds in the championship section at New Balance Nationals after their New England Champs performance. Suffield started off in the middle of the pack after a 2:01 first leg split by Cam Miller, before the second leg Jared Sharp ran strong 1:56 split to move them up just off first place. However, Brookline (MA) created some separation on Suffield's third leg Kyle Englander (1:59 split) on the final before handing off to their Foot Locker Nationals qualifier Lucas Aramburu with a second or so margin. It was up to Suffield junior Nick Sinofsky to run down the national class runner Aramburu. Sinofsky was able to catch Aramburu and then power away with a 1:54 anchor leg to secure the New England title as well as new meet record for his squad. An incredible 10 second drop from their season best time at the state meet just two weekends ago. Now they turn their attention to nationals and chase after the state record which they were a second off of this past race and possibly contend for a national title as well and certainly All-American honors.